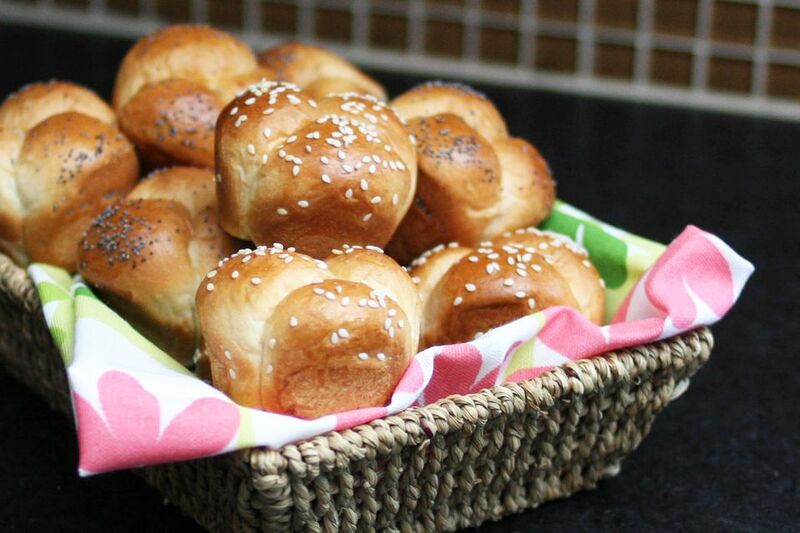 These soft cloverleaf rolls are finished with an egg wash and then they're topped with poppy seeds or sesame seeds. Serve these delicious cloverleaf rolls along with a holiday dinner or everyday family meal. They're especially good served warm and buttered. As with many yeast roll recipes, the dough is quite versatile. Shape the dough into pinwheels, crescents, or bake them in a buttered 9-by-13-by-2-inch baking pan as pull-apart rolls. In a large mixing bowl or bowl of a stand mixer, combine the flour, milk, instant yeast, salt, sugar, 1 large egg, and 5 tablespoons of softened butter. Mix the ingredients — by hand or with the dough hook — until well combined. Increase the mixer speed to medium-low and beat for about 10 minutes, until the dough is smooth and elastic. Or, move the dough to a lightly floured surface and knead by hand for about 10 minutes, until smooth and elastic. Add more flour as needed to keep the dough from sticking to the bowl or kneading surface. Grease a large bowl generously with softened butter. Put the dough in the buttered bowl and turn so the entire surface of the dough is coated with butter. Cover the bowl with plastic wrap and let the dough rise in a warm, draft-free place for about 1 to 1 1/2 hours, or until it has doubled in bulk. Grease two 12-cup muffin tins with butter or spray with nonstick cooking spray. Remove the dough to a lightly floured surface. Divide the dough into 24 uniform pieces. Divide each piece of dough into 3 small pieces, roll into balls, and put 3 balls in each of the 24 muffin cups. Cover the pans with a clean kitchen towel and let the dough rise for about 30 to 45 minutes, until doubled in bulk. Preheat the oven to 375 F / 190 C / Gas 5. Remove the tea towel from the pan. Beat the remaining egg with 1 tablespoon of water. Gently brush the tops of the rolls with the egg and water mixture and then sprinkle with poppy seeds or sesame seeds, if using. Bake the rolls for about 15 to 20 minutes, or until the tops are nicely browned. The inside temperature or the rolls should register at least 185 F to 190 F on an instant-read thermometer. For a firmer crust, replace the egg wash mixture with 1 egg white whisked with 1 tablespoon of water. Brush over the tops of the rolls and sprinkle with seeds, if using.